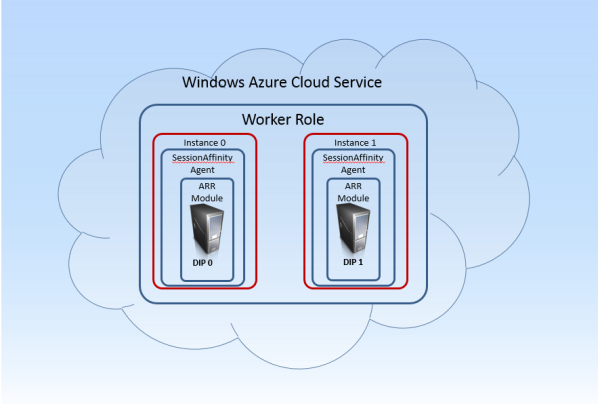 In previous post I've reviewed what Session Affinity is and why it is so important for your Windows Azure (Cloud Service) deployments. I also introduced the SessionAffinity and SessionAffinity4 plugins, part of the Azure Plugin Library project. Here I will describe what this plugin is and how it works. The two most important features of ARR that will help us achieve Session Affinity are the URL Rewrite and load balancing. Of course they only make sense when there is a Web Farm of Servers to manage. First and most important of all – SessionAffinity plugin only works with Worker Roles! This type of role you will use when you want to deploy a non .NET web server (Apache, Apache Tomcat, NGIX, etc.) . This is very important. 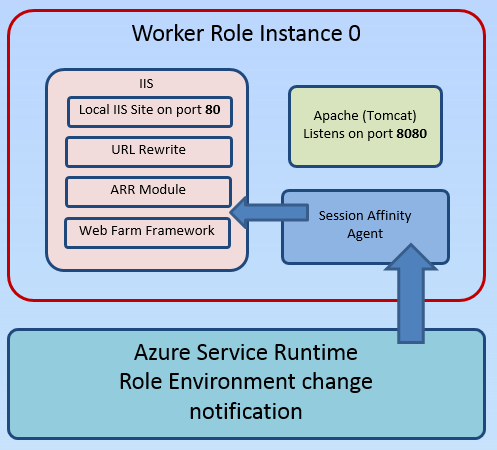 Web Role is special kind of Role, and the internal Azure infrastructure does additional things on IIS configuration which literally mess with the Session Affinity plugin and ARR configurations. So, use only Worker Roles when you want to use Session Affinity. SessionAffinityAgent.exe – a .NET based console application which is both configuration utility and watchdog service. It completes the initial configuration of the ARR – sets the load balance algorithm to Weighted Round Robin and configures the affinity based on cookie! The second important job of this application is to monitor the Azure Environment for changes via the RoleEnvironment.Changed event. This event occurs when any change to the role environment happens – instances are added or removed, configuration settings is changed and so on. You can read more about handling Role Environment changes on this excellent blog post. When you happen to add more role instances (or remove any) all the ARR modules on all the instances must be re-configured to include all the VMs in the Web Farm. This is what Session Affinity agent is doing by constantly monitoring the environment. With this setup now there is ARR module installed on each of the instances. Each ARR module knows about how many total server are there. There is also a software load balancer (part of the Web Farm framework), which also knows which are all the servers (role instances). Web requests going to port 80 are accepted by the local IIS site. It has a configured URL Rewrite Rule which transfers the request to the local Web Farm Framework. Web farm framework is aware of all the servers configured in the setup (all role instances). It checks where an affinity cookie exists in the requests. If such cookie does not exists, random server is chosen from the pool and new cookie is created to keep track of which user was assigned to the user. The request is finally redirected internally to the Apache listening on port 8080. This information is synchronized across all servers that are part of the Web Farm. Next request will have the cookie and the user will be sent to the same server. As its name suggest this is Timeout in seconds. Timeout for what? If we look at the flow chart we will see that there are a lot of things to happen. The last one is waiting for response from the Apache Web server (on port 8080). This timeout indicates how long will the ARR module wait for response from Apache before sending Timeout Error (HTTP 50x). If you don't set value for this setting, 180 seconds (3 minutes) is considered a reasonable time to wait. If you want, you can change this value in the Service Configuration file. For example if you have some heavy pages or long running operations you may want to increase the timeout. Be careful, the error page returned to the end user is a standard HTTP 500 error page! So it is better that your server never times-out, or at least you have to configure the value of ArrTimeOutSeconds to a value which is greater then the expected longest processing page. Everybody speaks about recently announced partnership between Microsoft and Oracle on the Enterprise Cloud. Java has been a first-class citizen for Windows Azure for a while and was available via tool like AzureRunMe even before that. Most of the customers I've worked with are using Apache Tomcat as a container for Java Web Applications. The biggest problem they face is that Apache Tomcat relies on Session Affinity. I am web user X who opens the web application deployed in Azure. The Load Balancer (LB) redirects my web request to Web Role Instance 0. I submit a login form with user name and password. This is second request. 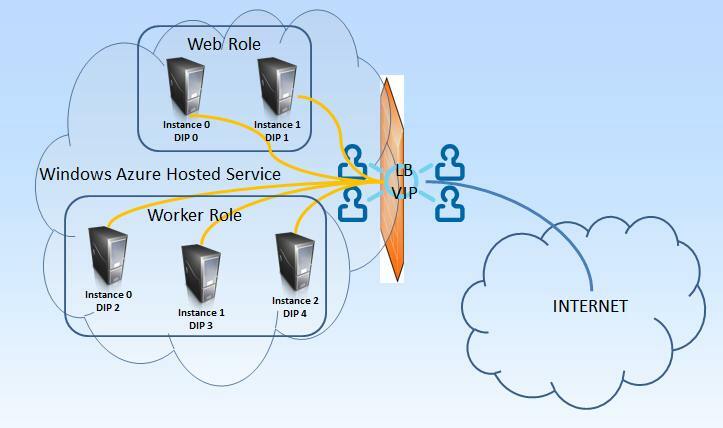 It goes to Web Role Instance 1. This server now creates a session for me and knows who I am. Next I click "my profile" link. The requests goes back to Web Role Instance 0. This server knows nothing about me and redirects me to the login page again! Or even worse – shows some error page. This is what will happen if there is no Session Affinity. Session Affinity means that if I hit Web Role Instance 0 first time, I will hit it every time after that. There is no Session Affinity provided by Azure! And in my personal opinion, Session Affinity does not fit well (does not fit at all) in the Cloud World. But sometimes we need it. And most of the time (if not all cases), it is when we run a non-.NET-code on Azure. For .NET there are things like Session State Providers, which make developer's life easier! So the issue remains mainly for non .net (Apache, Apache Tomcat, etc). So what to do when we want Session Affinity with .NET web servers? Use the SessionAffinity or SessionAffinity4 plugin. This basically is the same "product", but the first one is for use with Windows Server 2008 R2 (OS Family = 2) while the second one is for Windows Server 2012 (OS Family = 3). I will explain in a next post what is the architecture of these plugins and how exactly they work.